We’ve had a pretty spectacular year at the box office for movies so far in 2013, and a lot of the thanks goes to those old standbys: the summer blockbusters. The summer of 2013 saw huge hits out of several genres of film; from superheroes to horror, from racing movies to family friendly titles and sci-fi, there were records to be set everywhere. Of course with ups there are inevitably downs, and this summer saw its fair share of box office bombs as well as hits. 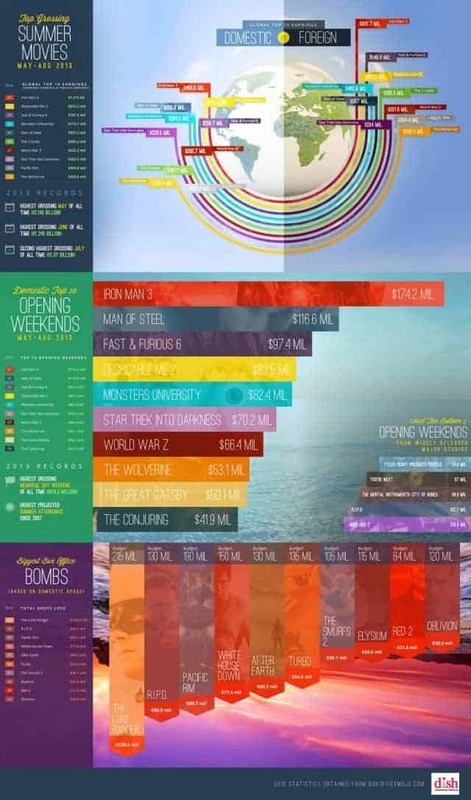 Today’s infographic from /Film gives us a look at both the highs and the lows of a summer packed with movies. Iron Man 3 broke the $1 billion mark globally, and Hollywood set grossing records for both May and June. Other movies, such as The Lone Ranger (which lost a total of $126 million), didn’t fare so well. Some movies actually ended up falling into both categories. While Pacific Rim was one of the top 10 grossing movies of the summer globally ($404 million), its domestic gross was less than its budget.